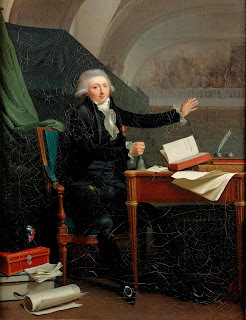 Here are a couple of posts on works by Louis-Léopold Boilly from the Revolutionary period. The iconic Triumph of Marat is one of several canvases bequeathed to the Musée des Beaux-Arts Lille by the artist's son Julien. In the late 1980s and 1990s the genesis of this painting and its place in Boilly's oeuvre was the subject of a major revision by the American art historian Susan Siegfried. Ironically, until this time the picture had been interpreted in a way which tended to confirm Boilly's anti-Revolutionary credentials. Tradition had it that it was painted under duress, in order to vindicate Boilly against charges of anti-Republicanism made against him by a fellow artist from the Lille, the painter Jean-Baptiste-Joseph Wicar. 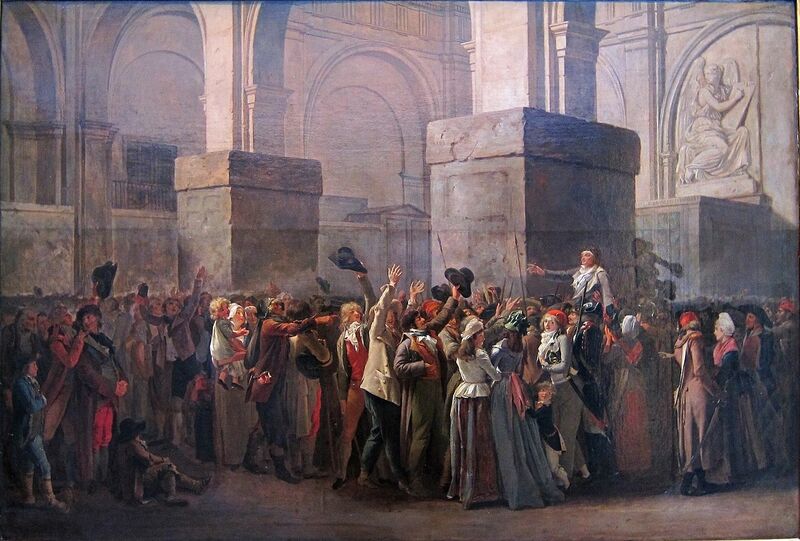 On 22nd April 1794, at the height of the Terror, Wicar denounced before the patriotic Société Républicaine des Arts, certain works of a shocking obscenity that offended Republican morality, and which must be "burned at the foot of the Tree of Liberty". The Society duly agreed to draw up a list of offending works for presentation to the Committee of Public Safety and the police. Boilly, who was mentioned by name, was warned of the danger he was in by one of his colleagues - either Baron Gérard or Anne-Louis Girodet-Trioson - and improvised this Revolutionary subject in record time. In some accounts he was even subject to a domiciliary visit and was saved from imprisonment only by the presence of the painting in his studio. The Société was so impressed by his patriotic credentials that in May 1794 it accepted him as one of their members. Susan Siegfried contested this account. She pointed out that the idea that Boilly was hostile to Revolutionary subjects and undertook the Marat reluctantly originated only in 1828 with Julien Boilly who was responsible for selling his fathers' works. Julien Boilly claimed, "one should know that this painting was undertaken out of terror, not inclination" . However, he did not recount the specific circumstances, noting only that his father recalled being threatened with proscription. Wicar's biographer Beauchamps depicts Boilly triumphantly outmanoeuved his accuser. He skilfully defended himself before the Société, drawing on the arguments of engraver Sergent, a Jacobin of impeccable credentials, who held that artists could not be blamed for their pre-Revolutionary subjects and their exploitation by printmakers. As a result the Société not only welcomed him as a member and but dropped, with some relief, Wicar's plans for denunciations. Although Boilly was no political activist, he had from the first shown a willingness to adapt in order to survive commercially in the new artistic climate created by the Revolution. He took full advantage of the new opportunities to exhibit and welcomed the opening up of the art market. He exhibited regularly at the Salon de la Jeunesse in fashionable venue of Lebrun's gallery - he and his fellow artists styled themselves "les artistes libres" - and was involved in the foundation of the Société des amis des arts., which sought to expand the availability of commercial art. He also begun to produce Revolutionary portraits such as that of Jan Anthony d'Averhoult, painted in 1792 (Siegfried, Art de Boilly, p.34-6). The real origin of the Marat was the great concours de l'an II which was announced on 24th April, only two days after Wicar's denunciation. The Revolutionary government launched a national painting contest to commemorate the anniversary of Marat's successful acquittal the year before. The event provided an opportunity to affirm painting in public interest and to provide financial support for patriotic art. Boilly entered eagarly, presumably for the chance of respectability and commercial gain: despite his efforts, the Revolution had destroyed much of the market for his work and his financial position in 1793-94 was precarious. The Marat was by far the most ambitious work he had undertaken, and the first of the complex multi-figure compositions which later came to characterise his work. On 28th May 1794 he submitted an elaborate finished drawing, now in the musée Lambinet. He then immediately began on the full version. Triumph of Marat, black ink and wash on brown paper. 66.5 cm x 80.7 cm. The unfinished state of the present canvas is easily explained by political events, for Boilly judiciously withdrew his works for the competition less than a month after the fall of Robespierre. However, he continued to enter public competitions in the Revolutionary period, notably in 1799 when he submitted his splendid, but politically uncontentious Reunion of Artists in Isabey's studio. Julien Boilly subsequently had the Marat mounted (it is painted on seven separate sheets of paper) and possibly retouched it, though to what degree he added to the composition is uncertain. The triumph of Marat was an unusual and daring subject. Only two of the other 140 entries to the competition represented Marat and both were depictions of his assassination. Boilly sought to situate the occasion, now made acceptable by Marat's death, in history of revolutionary journées. 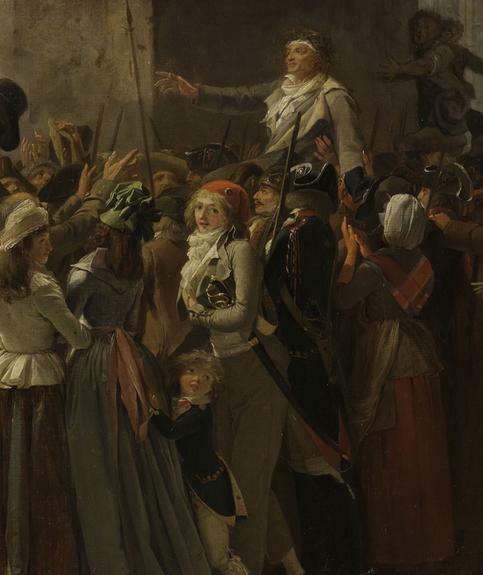 As is often pointed out, the real subject of the picture is the crowd - in Boilly's hands this becomes a respectable and orderly grouping, suitably removed from the Revolutionary canaille. (The figure with the red bonnet in front of Marat is generally considered to be a self-portrait.) 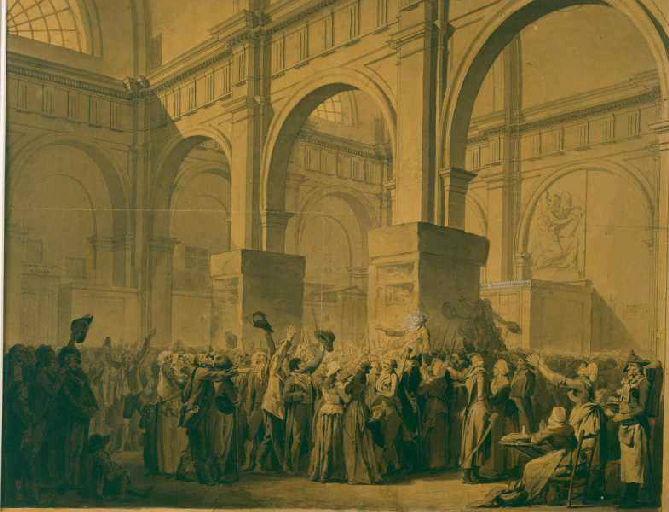 The elaborately studied mise-en-scene recalls David's Oath of the Tennis Court; Susan Siegfried also compares Charles Thévelin's depiction of the crowd in his Festival of the Federation, 1792. Boilly's painting represents a highly individual artistic contribution. He deliberately avoids a theatrical treatment of the incident or any apotheosis of Marat, instead describing the event with an attentive objectivity little practised at that period, neither deviating into the grotesque nor the anecdotal occasionally characteristic of his drawings. The retouches by Julien Boilly do not alter the painting's intrinsic quality: a spontaneity of drawing and of pictorial realisation contribute to a remarably masterful representation of a crowd - of which Boilly would produce other examples under the Empire. Marat was accused on 12 April 1792 of attempting to use his newspaper to destroy the Convention. He was arrested, but escaped from prison and appeared on the eve of judgment at the Palais de Justice on the 23rd, where he was the object of zealous attention from municipal officials and police administration. He was given a room for the night at the tribunal, brought dishes from the restaurant and decanters of wine. The following day, 24th April, the Grand'Chambre was crowded to capacity. Briquet, one of the tipstaffs of the tribunal had sold seats. The judges entered. Marat appeared and haranged the crowd: he was not a guilty man "but the apostle and martyr of liberty". He took effective control of proceedings and was immediately triumphantly acquitted. The crowd climbed over the barriers, hoisted Marat onto a table, and festooned him with palms and wreaths; he was then carried triumphantly through the Palais and down the steps of the Cours du Mai. 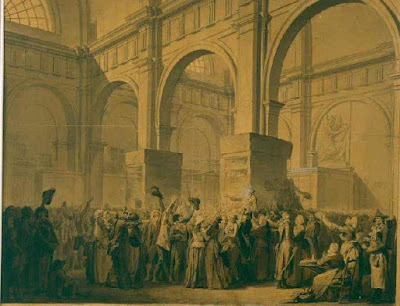 Of some interest to the historian is Boilly's depiction of the great gallery of the Palais de Justice, the Salle des Pas Perdus, in the Revolutionary period. According to Lenotre in pre-Revolutionary days this was the crowded centre of the judicial world. Around each of the pillars were stalls, let out at high rental to "booksellers, jewellers, public scriveners, shoemakers, sword-cutlers, and even pastry-cooks and lace makers". By the central Gros Pilier congregated the most celebrated advocates and influential personages of the day. In Boilly's picture, the gallery appears stripped of its finery, adorned only by an austere neoclassical frieze. At the right of the picture, is the door which led directly from the Grand'Chambre of the Parlement, now the seat of the Revolutionary Tribunal. The sculpted figure must be one of the bas-reliefs for the doors, "both in the interior and exterior of the hall", commissioned in 1792 from the Jacobin sculptor Francois Daujon. Lenotre, The Tribunal of the Terror; a study of Paris in 1793-1795 (1909), p.2; 16-17. Susan Siegfried, The Art of Louis-Leopold Boilly: Modern Life in Napoleonic France, Yale University Press, 2003, chpt 2, p.29-52.